ECG-gated 3D contrast enhanced MRA (ceMRA) provides high spatial resolution and minimal pulsation artifacts in the visualization of cardiac and pulmonary vasculatures [1, 2]. 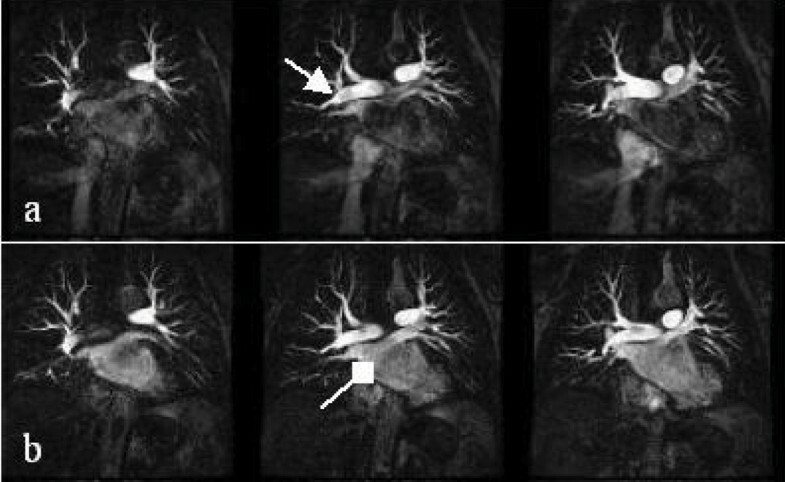 Dynamically-resolved ceMRA techniques can improve workflow by eliminating the needs for timing bolus acquisition, and enables better separation of arterial and venous vasculatures . However, applications of dynamically-resolved gated ceMRA have been limited due to the increase in scan time associated with ECG-gating. Spatial and temporal resolution, or alternatively anatomic coverage, are often compromised to meet the breathhold limitation. We propose a novel multi-dynamic-phase ECG-gated 3D MRA approach to obtain high-spatial resolution and temporally-selective contrast-enhanced images within a single breathhold. Automatic triggerring is also incorporated to robustly capture the desire dynamic phases. The conventional ECG-gated, dynamically-resolved, ceMRA technique acquires data only in a portion of the cardiac cycle, resulting in relatively low scan efficiency. In the proposed Contrast Inflow Dynamics MRA (CIDA) technique, multiple cardiac phases were acquired within the cardiac cycle in a 3D acquisition. By altering the slice ordering of each phase, the center of k-space of each 3D dataset can be adjusted to a different time point following a single contrast media injection, thus providing images of multiple dynamic phases along the contrast arrival curve in a single breathhold acquisition (Fig 1). A variable-center slice ordering scheme that minimized k-space discontinuity was developed to increase the flexibility in temporal selectivity. The automatic triggering sequence continuously monitored for contrast arrival at a user-specified ROI, thus eliminating the need for timing bolus run. Various ROIs for automatic triggering were examined to allow a 5-second breathhold-preparation interval between the contrast detection and ceMRA acquisition, while capturing the desire dynamic phase in time. Contrast-enhanced 3D MRAs [3D SPGR, TR/TE/θ = 4.3/2.0 ms/40°, SENSE 2, partial-kz, 1 NEX, 1.3 × 1.6 × 3 mm3 resolution, 2 phases, scan time = 20 heartbeats/25 slices] using the CIDA technique were performed on 4 volunteers, using a 1.5 T MRI with an 8 channel cardiac coil (GE Healthcare, USA). Acquisitions were performed with first pass contrast (0.2 mmol/kg gadoteridol (ProHance; Bracco Diagnostics, New Jersey, USA), 2 cc/sec injection rate). All volunteers provided informed consent for participation in this IRB-approved study. CIDA technique. Variable center slice ordering scheme adjusted the center of k-space of the systolic and diastolic phases to coincide with the contrast arrival at the desired anatomy. For the visualization of pulmonary arterial (pulmonary artery) and venous(pulmonary veins and left atrium) system specifically, we found that superior vena cava is the optimal ROI for automatic triggering. Futhermore, the separation between the two systems could be achieved with a 5–7 seconds center of k-space separation between the two dynamic phases. Figure 2 shows the result from a volunteer; High spatial resolution ECG-gated 3D MRA of both the arterial and venous phases were obtained in a single breathhold, utilizing a single injection. With the variable-center slice ordering scheme, the temporal positions of the two dynamic phases were adjusted to coincide with the contrast arrival time at different regions. Cardiac motion was suppressed since the data for each phase was collected within a consistent window in the cardiac cycle. The CIDA technique can further be combined with other time-resolved MRA techniques, such as TRICKS, to provide a cardiac motion-suppressed time-resolved MRA, without significant penalty in scan efficiency. CIDA with automatic triggering performed on a patient. Figure 2a shows the systolic phase with no delay, capturing at the contrast inflow at the pulmonary arteries(arrow). Figure 2b shows the diastolic phase with 6 seconds delay, capturing the pulmonary veins and left atrium (diamond arrow).